This article first appeared in the Coloradoan newspaper, which took a tomahawk to it and ruined it. You won’t like absinthe if you don’t like black licorice. Absinthe — mint-green star in a constellation of multicolored bottles, over-proofed, over-hyped, overrated, mythologized, mystified and then demystified — won’t, all reports to the contrary notwithstanding, make you hallucinate. It’s the sweet fennel and green anise that give absinthe its unmistakable licorice flavor. In answer to your next question, the ban was lifted nearly a decade ago. Was absinthe invented by hipsters for hipsters? No. But you’ll be excused for thinking so. The word itself comes from one of the many botanicals of which it’s composed: Artemisia Absinthium, which means “grand wormwood” — an herbaceous perennial with slender, silvery-green leaves that’s been used medicinally since at least 1500 BC, beginning with the Ancient Egyptians. The standard story of absinthe’s modern-day manifestation is that it was concocted (circa 1792) by Pierre Ordinaire, a French doctor who practiced in Switzerland, and who later passed his recipe along to certain sisters named Henriod. In fact, though, some say that Madame Henriod is the actual originator of absinthe: a confection she made from plants gathered in the Swiss mountains around her home — this according to one Jessyka Birchard, brand director of Pernod Absinthe. This elixir, says Birchard, was later tinkered with by Dr. Pierre Ordinaire, who marketed it as medicinal. An ambitious entrepreneur called Major Dubied came across the absinthe recipe and, after seeing the potential to brand it as a kind of nostrum with vast medicinal properties, partnered with his son-in-law, Henri-Louis Pernod, to set up the first absinthe distillery. This was in Switzerland, in 1797. 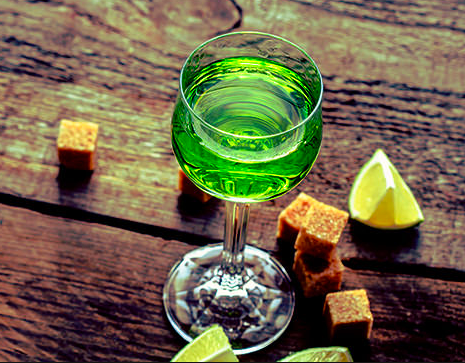 Thus was born absinthe as we know it today. The mint-green gem of absinthe deep in the glass, where you guzzle perdition and feel the thunder of god’s judgement that roasts the naked soul. Paul Verlaine described it as. Wow. You weren’t kidding when you said they butchered it. Why in the world would they remove that last line??? Morons. Thanks for letting us know the original was available on your site. This version feels so much more complete. Well done. Cindy, my dear, you’ve just made me feel vindicated. Thank you. I remember this article like it was yesterday. I immediately went out and bought a bottle. They got me for something like 80 bucks. It was winter and I crunched over ice through alleys to find the party. The Cant-Grows were yapping behind fences of the underclass. I found the party: a bunch of sullen hipsters who were considering careers in online content. The liquor gave me a grave buzz. But then my stomach protested. I liken the experience to The Bends. I walked back through the alley–Can’t-Grows wailing from near frostbite, sorry Christmas things displayed in windows. I’ll never touch that green crapped again. I vomited for days. Ha-ha-ha! That was quite good. Don’t handle the katzenjammers like you used to, old boy? Ray, do you have any idea why it’s so expensive? How much does a guy have to charge for it? I would try it again if they priced it for a guy of my economic endowment.